For most of my life, I have lived or worked near the Delaware River. Being raised in a small resort town in Pennsylvaia very close to the New York border., I came to love and respect the river. Every school day since Junior High, I'd cross the river to attend High School in Narrowsburg, NY. 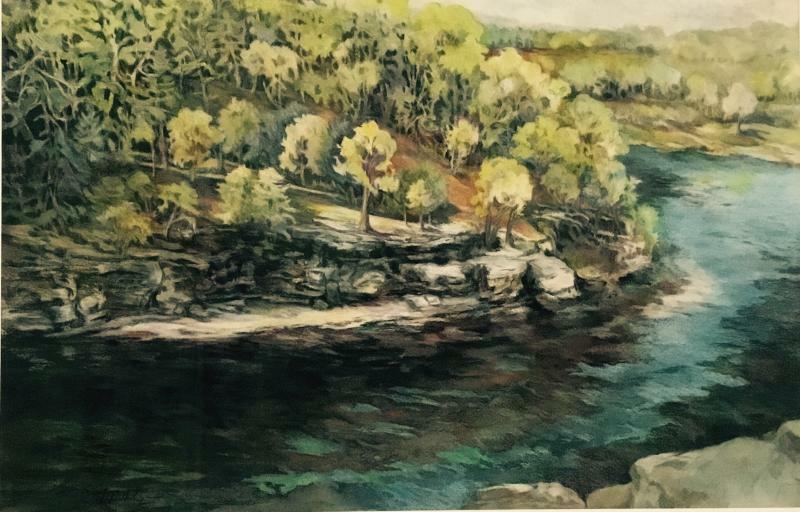 Friends and I would climb down onto the rocks in the summer on the river, being careful to avoid the eddy known as the "Big Eddy". Experiencing the power and beauty of the Delaware can only be experienced up close and personal. Changes in residences and business always demand that I cross the Delware. Now, instead of crossing between Pennsylvania into New York as a student and young adult, I now cross over the Delaware from New Jersey to Pennsylvania as an artist to get to my studio in Easton, Pa. It has been a great honor to have my art studio recognized by National Geographic and the Scenic, Wild Delware River Geotourism Council. To be showcased as one of the best destinations along the Delaware for travelers to visit is indeed humbling. Please visit http://delawareriver.natgeotourism.com website for information on all destinations selected by National GeoTourism. “Bend in the Delaware”. Watercolor and tinted graphic. Inspired by a photo taken from the Narrowsburg NY side looking into Pennsylvania. Juried into Lehigh Art Alliance show at the Banana Factory in Bethlehem, Pa.